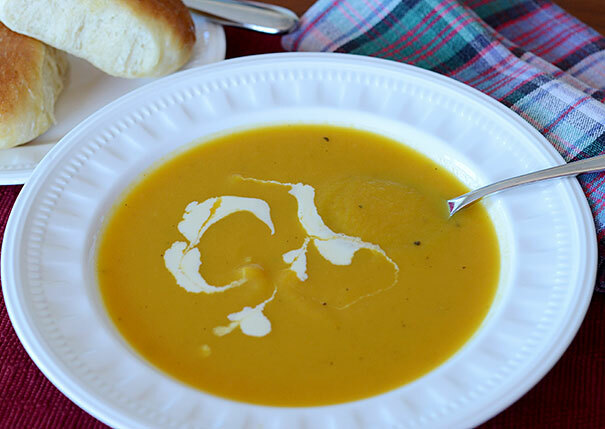 This soup is quite easy to make and doesn't take too long either. Paired with some rolls, it's a great meal. In a large saucepan on medium heat, add the oil and the onion. Cook for 4 minutes until the onion is soft. Add the carrot and apple and cook for a couple of minutes longer. Add the pumpkin, curry powder and stock and bring to the boil and then reduce to a simmer. Cover and cook for about 30 minutes until the pumpkin is very soft. Add the pepper and taste for seasoning. Process with a hand blender or in batches in a food processor or blender. Return to the heat and add the cream but do not boil. Serve with a drizzle of cream and a few croutons in the center of the bowl if you want it to look pretty. I took the photo before I remembered the croutons, sorry.